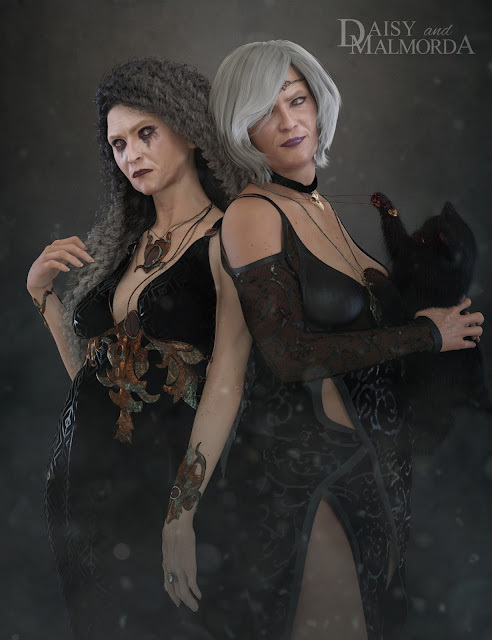 This is our new product for our Daz 3D store: EJ Daisy and Malmorda For Genesis 8 Female is a character that includes 2 alternative shapes for head and body: an affable lady of sweet face with elegant beauty, and a strong thinner elder woman with a deep and terrifying gaze. 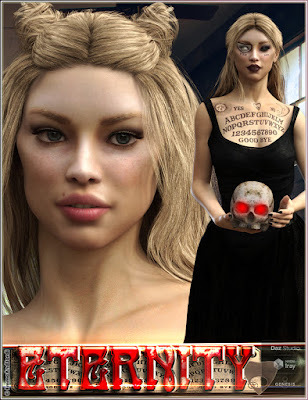 With lots of options like casual and fantasy makeups, and 4 skin tones, both can become main characters of many of your renders as casual characters, sorceresses, fantasy queens, fairy godmothers, terrible witches, or experienced warrior queens. 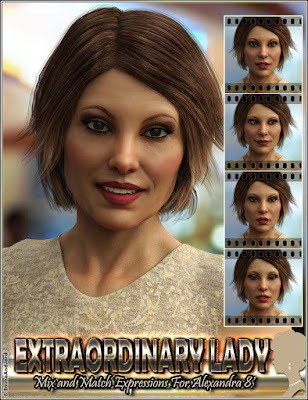 This is our new product for our Daz 3D store: Extraordinary Lady is a must have expression pack for Alexandra 8 and Genesis 8 Female(s), that consists in expressions organized in three folders (Full Face, Upper Face, and Lower Face), and you also have pose control ERC dials to apply each full face expression. This is our new product for our Daz 3D store: Rowana Hair For Genesis 8 Female(s), a half up tied back medium hair with middle part. It comes with style and movement morphs that allow you to change the volume of each side or the top, blow it easily with wind, change its length, and many other things. The material presets included can dye it with a total of 40 different tones, from classic ones to sophisticated two tones, and 9 fabrics for the tie. This is our new product for our Daz 3D store: EJ Eternity for Genesis 8 Female, a beautiful character for Genesis 8 Female that includes 4 skin tones, fantasy makeups including Stitched Mouth and others, a classic oracle tattoo in her torso, special eyes, nail morphs, custom detail morphs on the body, and casual makeups and lips.To show Eternity as a living character, we also included 10 subtle expressions in this product, that you can use in your images to reflect her personality.